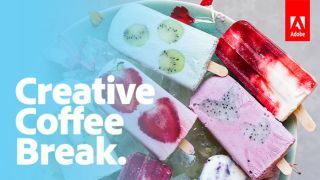 Adobe's Creative Coffee Breaks offer bite-sized tips for your Creative Cloud tools. Adobe has launched a series of mini-tutorials to help you get the most out of your Creative Cloud subscription. The Creative Coffee Break series aims to teach you new skills and show you how to push the limits of what you can create with your Adobe tools. Each video lasts under two minutes – which means you can easily grab a cup of coffee, take a mini break from work, and learn a new trick to improve your work. The first two tutorials are live now (scroll down to watch), and over the next few weeks Adobe will be rolling out six more bite-sized videos. Each is presented by an exciting up-and-coming creative, and will reveal a new technique or trick you can use in Adobe's flagship Creative Cloud programmes. There are Creative Coffee Break tutorials for InDesign, Lightroom, Illustrator, Adobe Stock (Adobe's impressive library of stock images), After Effects, Photoshop, and Premiere Pro. The first tutorial is presented by Ron Timehin, who shows you how to colour-grade video content in Adobe Premiere Pro. Watch it below. The second video comes from fine art and fashion photographer Adam Bird, and gives a rapid-fire look at how to retouch images in Adobe Photoshop using the Clone tool. You may feel like you know exactly what you're doing with your daily creative tools but trust us: there's plenty to learn! So, fire up your favourite app and try out some of their tips now.